Viral videos ruin lives. That’s the claim being made by David Golson, a 30-year-old Bronx man seen by more than a million people across the Internet getting violently restrained and having his clothes torn off in a convenience store. 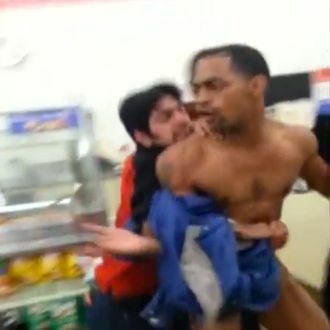 The clip, taken in a Brooklyn 7-Eleven near Barclays Center last year — and subsequently posted to WorldStarHipHop, YouTube, and countless blogs — shows the store’s clerks manhandling Golson, who resists, for allegedly shoplifting. “This is ridiculous! For some damn Snickers?” says the man behind the camera. And now Golson is suing. Golson was charged with robbery, assault, criminal mischief, and criminal possession of stolen property, according to the New York Post. He also had an outstanding warrant. “The media attention resulting from the extensive coverage of the incident and the widespread dissemination of images showing [Golson] stripped almost naked have caused [Golson] to suffer severe humiliation, mental anguish and emotion distress from which he may never recover.” An unspecified amount of money might help. Of course, the suit also ensures even more people will see the video.